This question comes up so frequently, I don't know why I haven't posted it here on my blog already. The out-of-the-box views of activities are not very helpful at all. The first thing anyone using CRM 1.0 or 1.2 wants to do is put more useful columns in the activity views. I'm not sure if this was an accidental oversight of Microsoft or not, but the view customization forms are available, they just aren't linked to from anywhere in the web UI's customization pages. The metioned link does'nt work. Make sure that you replace 'crm' in the URL with the name of your CRM server, and it should work fine. Do you have any idea why this happends? Likewise here -- I tried to customize the "Activities Associated View" to add a "Due Date" column. When I clicked "Save" I got "Error Description: Invalid item id". Any thoughts? This has been very helpful but cant locate the history tab view? You can find a list of the available views in the SavedQueries table in the CRM database. Locate the name of the view you want then use its GUID in the URL. The view you want for the History tab is called AssociatedItems, IIRC. Do you know of a way to customize the Account Preview window, when you click on the little arrow. I'd like to modify it to show the Subject (ie notes part) of the Activity. 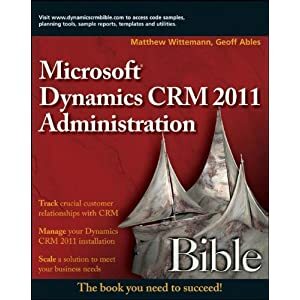 Matt is there a way to do this crm3.0? I can't find the GUID for the queue view, specifically the My Work queue. Where is this under? I noticed you can also customize the actual activity forms by replacing the objectTypeCode with the activitytypecode Ex. resolution of a case: http://crm/tools/formEditor/formEditor.aspx?objectTypeCode=140. Have you tried this? How would you publish this customization? All views are customisable through Advanced Find, and selecting "View" as the entity. Then use the lookup to select the view you would like to edit. Yes, it's much easier in version 4.0. This wasn't the case in version 1.2, when this blog post was originally published.